A standalone Dark Void PhysX benchmark is available for download. A demo is available; here, here or here. It includes the level Into The Void. Two patches are available for the game's PhysX engine; main PhysX patch and second PhysX patch. 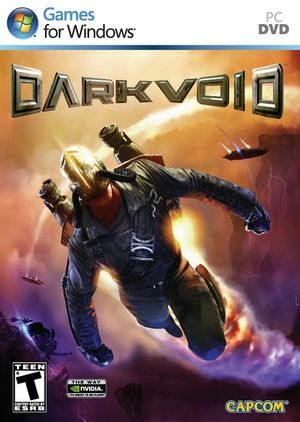 Retail version of Dark Void requires the main PhysX patch to be applied first. Delete or rename the Movies folder. Image is pillarboxed 16:9 render. Use Flawless Widescreen. See Field of view (FOV) or Debug controls. Toggle with Alt+↵ Enter, use the -windowed parameter or see Additional video settings. 4x by default. For higher quality see Additional video settings or force it in the GPU control panel. Can be forced in the GPU control panel, but using injectSMAA is recommended, because it works on plants and foliage too. The Dark Void plugin for Flawless Widescreen can change the base FOV by -20 to +20, but this can be modified to get a much wider FOV. Run it and install the Dark Void plugin. Go to the Flawless Widescreen installation folder. Open DarkVoid.lua with a text editor. Change it to fAdditionalFOV = Sender:GetScaledFloat(2). This will make the FOV slider go from -50 to +50. Restart Flawless Widescreen and adjust the slider. DepthOfField=True - Disabling depth of field also disables bloom and god rays. Fullscreen=True - Toggles fullscreen/window mode. MaxAnisotropy=4 - Anisotropic filtering quality can be set to 0, 2, 4, 8 or 16. Master, music, sound FX and voice. Change DebugBindings to Bindings to enable a control. Changing the value under Name changes the input key, if the key is already used for another control it will not work. DebugBindings=(Name="G",Command="god") - Toggles God mode. DebugBindings=(Name="M",Command="allammo") - Gives full ammo. DebugBindings=(Name="P",Command="PlayersOnly") - Freezes every dynamic object except the player. DebugBindings=(Name="O",Command="Slomo 0.5") - Changes the game speed (another key needs to be set to 1.0 to restore the original speed). DebugBindings=(Name="NumPadOne",Command="FOV 60") - Can be used to change the FOV to a custom value, but it gets reset to a small value after cutscenes. Default is around 65. 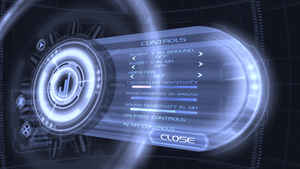 DebugBindings=(Name="B",Command="ToggleHud") - Toggles HUD rendering. DebugBindings=(Name="F1",Command="viewmode wireframe") - Wireframe rendering. DebugBindings=(Name="F2",Command="viewmode unlit") - Disables light, shadows and post-processing effects. DebugBindings=(Name="F3",Command="viewmode lit") - Restores normal rendering mode. DebugBindings=(Name="F5",Command="tiledshot 4") - Takes a high resolution screenshot (7680x4320) and stores it in %USERPROFILE%\Documents\My Games\Airtight\Dark Void\SkyGame\ScreenShots\. ↑ 1.0 1.1 File/folder structure within this directory reflects the path(s) listed for Windows and/or Steam game data (use Wine regedit to access Windows registry paths). Games with Steam Cloud support may store data in ~/.steam/steam/userdata/<user-id>/45710/ in addition to or instead of this directory. The app ID (45710) may differ in some cases. Treat backslashes as forward slashes. See the glossary page for details.